Not to be rude but why do you assume that any of us are less familiar with the manuscripts than you are? Some of us have even read them in the original text, I do not assume things like that because it comes off somewhat coarse. Is there a reason why your interpretation is better than the many others out there? I have seen many interpretations of various manusrcipts that were not how i viewed it but could be just as acceptable as mine. I agree soft targets would be prefered but I think it not unlikely that other targets were used. The fact the weapon penetrated a munitions breastplate of the later era would indicate that in the earlier ones it would likely do the same as they were thinner and also in most cases against armour being of like lesser quality, soft, would be more susseptable to the weapon. The test though does not mean they would have tried to penetrate as a rule per se but that it was possible. I can't really show you with an actual harness because most of them don't seem to be mounted well on their stands (often showing way too much space as in this case: http://therionarms.com/armor/armor3.jpg and on most paintings the artist makes the armor look far more comprehensive than it can really be (as in the Talhoffer plates). Now even though this is just a reproduction, it matches well with what I've seen of some real harnesses. See the small patch of white on the shoulder between the pauldron and the helmet? that's the leather (buff in this case) that connects the back and breastplates. Now a thrust to that spot won't be very easy, of course--that's the purpose of armor, to minimize the openings. Covering that spot the wearer would have mail from the skirt of his mail standard, and possibly (although probably not in this particular case) mail from his voiders (this is more likely on an early Italian harness). So you have to punch through at least one and possibly two layers of mail to do any damage. Now it's not super easy to break links of mail (although it can *certainly* be done!! ), but with the dague or queue of a pollaxe you really don't have to: The spike-like shape will drive into the mail for at least an inch or so, then, because mail is flexible, it will give as the flesh beneath it compresses in the same way that if you push on a shower curtain it will move in even though you don't actually break the curtain. Thus without even breaking links you can cause a pretty horrific wound. the better target for this, of course, is the armpit, but it works here, too. Moreover, because of the shape of the spikes--spikes, not leaf bladed like most spears--you have an even better chance of breaking links of mail through the wedge effect. Not to be rude but why do you assume that any of us are less familiar with the manuscripts than you are? Good lord, Randall, where would you get that impression? Nothing could be farther from the truth. Some of us have even read them in the original text, I do not assume things like that because it comes off somewhat coarse. Is there a reason why your interpretation is better than the many others out there? I have seen many interpretations of various manusrcipts that were not how i viewed it but could be just as acceptable as mine. LOL! now I'm wrong for expressing my opinion of what I see and what my hours and hours of study and practice have shown me? Isn't that what *you're* doing? I have not and will not criticize you or your interpretations, but surely I'm permitted to respectfully disagree and tell you what I think, aren't I? Randall, I agree that it's possible to defeat armor, honestly. Really. I've said it several times in this thread. That's not the point. My point is that the masters tell us to use a different approach based on attacking the gaps between plates with thrusts and limiting swinging blows to targets that we are *sure* we can damage without the luck of breaking the armor. "If you want to place an attack at a place on a prepared man, then you must detect his openings quickly. First attempt to attack him in the face, but also under the shoulders, in the palms of the hands or from the rear in the gloves, or in the hollows of the knee, between his legs and to all the members there, where the armour has his joints inside. Because it is best to attack him at these places. And you should know exactly how you can attack those openings, so that you do not aim at a further one if you can attack a closer one more easily. Practice that with all weapons which belong to the fight." "If you want to strike with the pommel, you are to direct it particularly to his forward extremities. ... Strike with the pommel to his lead foot or his forward hand, where he holds the sword at the blade." When we read Le jeu de La Hache the master tells us the same things, but he adds the head as a target for swinging blows (Ringeck does too, he just doesn't specify it in that passage). The short version: It's better to thrust at the gaps between plates and to limit swinging blows to the head, hands and feet. I'm not sure what you feel I've said to be insulting or demeaning or denigrating or whatever you're feeling, but it's not the case. I don't think you're stupid, I don't think you're uneducated, I don't think you're being dense, I don't think anything negative at all and I was attempting not to come across as negative or ad-hominem in any way. At the same time, my opinion is based on some pretty good research and study and is certainly worth reading even by those who disagree. I'm very sorry you're reading something negative, but I simply don't see what could possibly be giving you that impression. Whatever it is, allow me to take this opportunity to state categorically that no such attitude is intended on my part. Maybe that's the problem. On most of the pictures I've seen, there's no visible gap between the pauldrons, bevor, and breastplate. 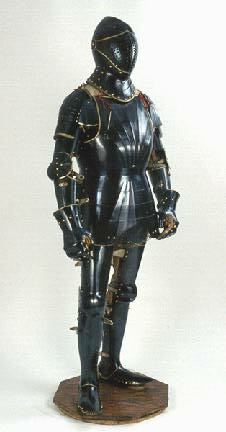 The feature of this site is good example: http://www.myArmoury.com/feature_gothic_armour.html. I didn't realize there was a gap there that had to be protected by mail, but that makes sense. Well, that's not the best helmet to put with that harness (although I think it's coeval), but I can still see gaps between the pauldrons, breastplate and helmet. More importantly, with that harness the skirt of the helmet itself offers a thrusting target--right up under the edge. It *can't* sit flat on the pauldrons or you wouldn't be able to wear it, so it has to be raised up slightly which creates an opening. A helmet (e.g., a grand bascinet such as that worn in the MacPherson harness I showed) that does sit down onto the armor must have a gap between it and the pauldrons or every time you make a shug-like motion (e.g., raising a spear into guard) you'd push the helmet up so it pops off or at least so the occularium isn't in front of the eyes. Well, that's not the best helmet to put with that harness (although I think it's coeval), but I can still see gaps between the pauldrons, breastplate and helmet. You must have better eyes than I do. On the German harness, it looks to me like the plates of the pauldrons, breastplate, and bevor all overlap. Let's please keep the tempers in check. They seem ready to boil over and it would be a shame to have a thread filled with so much great info go that route. We're not to the point of no return yet; please consider this a preemptive suggestion rather than a moderator's warning. I promise, I'm not angry at all! I am sorry if I've somehow offended Randall, and I assure both you and he such was not my intent. That's cool. I just wanted to put out a friendly reminder to everyone involved to keep it, well, friendly. I was looking at the Italian harness, not the Sigmund harness. Looking at the Italian harness, if you look between the edge of the Barbuta and the top edge of the right pauldron you can see the edge of the breastplate and a small gap between them. when you do, watch what happens when they raise their arms to shoulder level: The pauldron plates rise up to create a gap--they can't help it. This might seem difficult, but consider pressing the point of your weapon onto someone's breastplate--all those flutes are designed to channel your point, so you just let it ride along... to a spot of your choosing. I believe this is the aspect of Harnischfechten we're all missing: How to overcome armor. Not the techniques, necessarily (although those take a lot of work), but how to "work" the armor. What actions expose what targets, and how to you slide which point where (and, defensively, how to minimize that). We were working on Unterhalten or techniques on the ground with daggers in class last Saturday and everyone was fascinated to think about all the directions to place a dagger's point on an armored target when he's laying down; for example, when you lay on your back your fauld will automatically (well, in many kinds of harness) stick way up exposing your groin in a terrible way. Likewise, when someone is on his back his pauldrons will stick well up exposing a lethal target. The text of the first plate says: "The pulling, which concludes the beforementioned manuever"
The text of the second plate says: "Stab him thus when you can between the lacings of his armor"
make the armor look completely covered in the rear, but when you read the text you can clearly understand that Kal intends us not to thrust at the plate but at an exposed area. Not upset in the least. Sorry about my last post. I will think of a better way to post it next time. I am sorry if I was too straight forward. If I offended so very sorry. I honestly do not take offense that others have a different interpretation on it. That is what makes the field progress. And honestly when I am back in the states it would be good to meet up and see how you training is going. There are not many poleaxe training course availible in most places. I completely agree with idea of the idea of easy or quick attacks. Why take chances with something that might not work when your life depends on it. Attacking where their soft bits are exposed makes a much more valuable target as the fight is either a, switched in your favor (hopefully) b, over. This has been a very interesting discussion of techniques against armor. Seeing the importance of gaps in 15th-century armors, it makes me wonder what you could do against something like Henry VIII's tonlet harness: http://www.royalarmouries.org/extsite/view.jsp?sectionId=2844. You could still hit him in the head, of course, and thrust at his armpits, but that's about it. I doubt you could get the point of a pollaxe through those little holes in the face guard. True. In the end I figure a person skilled with the weapon sufficiently will know how to take someone in a suit like that down. The armour presents a challenge but you could rend or bend the joints at the legs, shoulders or arms enough where in a one on one fight you could make an advantage and then decide you next course of action, where and how to make the final strike. In the end the suit was made for the tourney so you would not need to get inside anyways I suppose. I can only imagine it would get to hot and uncomfortable in a totally enclosed suit really fast.... If used in battle you would likely be found afterward, no visible wounds but dying from dehydration or suffocation under a head of enemies. Part of the difficulty of this topic is in one man fights differ from huge numbers of men as hugh mentioned before where one holds the weapon for example. In the end you would use all the training you had to stay alive but that said it become a much different ball game. I believe this is the aspect of Harnischfechten we're all missing: How to overcome armor. Not the techniques, necessarily (although those take a lot of work), but how to "work" the armor. What actions expose what targets, and how to you slide which point where (and, defensively, how to minimize that). This is absolutely true, and is something that can't really be appreciated until you've actually worn armour and tried out these techniques. I myself don't really practice the harnisfechten other than academically, but I have tested out these techniques while wearing harness, and there are a number of things that suddenly become much more obvious than when you're looking at a drawn picture. For example, in Paulus Kal, folio 22v, the plate shows a the man thrust at the opponent's ankle. Looking at the image, the ankle appears to be completely covered by the greave and sabaton. Yet, when you put on armour, and stand as the opponent is standing, there is a gap that will open up as you start to straighten the ankle. The more you point your toe out, the bigger the gap. It isn't obvious in the image, but it becomes very obvious in real life. Well, remember what the Tonlet harness was designed for: It was intended for the Field of the Cloth of Gold, a huge *friendly* deed of arms. To the best of my knowledge tonlet harnesses were never intended for use in serious (by which I mean life or death fights such as judicial combats); they were only for the clash and clang of sportive engagements. But to answer your question, consider von Danzig's words. He said: "If you can't hit him well with an attack then you should resort to wrestling..." and later he says: "Now you should know that almost all parts of combat fencing in harness come at last to dagger fencing and to wrestling." If I was faced with an opponent in such a harness as this one I'd immediately consider wrestling both because of the limits I'd be facing in terms of harming my opponent through such a protective harness and because I know that his harness would limit his movement more than mine would me (remember, it was designed for a kind of combat where you just banged on each other--it wasn't about executing fancy techniques). I think I would use some technique that didn't require close body contact or leg action so as not to become lodged against his tonlet. A good example would be the arm bar: When I used the am bar to drive my opponent to the ground then I'd use an Unterhalten (ground work) technique from Master Martin Hundfelt's Fechtbuch in which you sit on your opponent's shoulders and reach forward over his face to pull his head up to create an opening for your dagger; I'll add a picture of the finish of this technique to this post. Alternatively, I could follow von Danzig's instruction here: "...when he falls you can grab him by one foot then stab him with the dagger below to the sole of that foot." Or I could simply reach up under the tonlet (which is going to be sticking *way* up in the air) and attack him with my dagger to the groin. So if you *really* wanted to kill someone in that sort of harness, consider his weakness (lack of mobility) his "openings" (none to stab, but his arms can be grabbed to take him down) and then you will *create* openings in his harness you can attack. Here's a picture of two of my students demonstrating the head lift technique out of armor. If I was faced with an opponent in such a harness as this one I'd immediately consider wrestling both because of the limits I'd be facing in terms of harming my opponent through such a protective harness and because I know that his harness would limit his movement more than mine would me (remember, it was designed for a kind of combat where you just banged on each other--it wasn't about executing fancy techniques). I know that armor was indeed designed for friendly combat, but does it really limit movement so much? Everything I've read about it says it was a great example of providing protection without limiting movement very much. The face guard, however, looks like it would make it harder to see, and I guess the tonlet itself might get in the way a bit when grappling. Well, I've never worn a harness like that one, it's true, but then neither have any of the people who've written all the things about how this armor is a magnificent expression of protection and freedom of movement. I have worn a harness (well the arm harness of it) with the upper canon of the vambrace articulated directly to the pauldron as this one is, however, and it was a serious pain. The upper canon has to be perfectly round because there's a rotating connection in it to allow the arm to turn while the pauldron stays in place. It worked, but it wasn't as easy to move in as a less-comprehensive armor and the roundness of the upper canon made it sit poorly against my chest with my arm down. The more bells and whistles your armor has the more it limits your mobility. 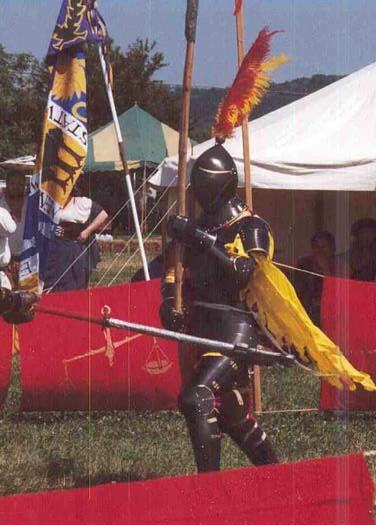 That limitation can be *minimized*, and I suspect this armor is a high-end example of allowing more movement than others of this type, but compared with an early-15th century Italian harness with a 3/4 vambrace (i.e., just a small flap of an upper canon) and nothing on the shoulder but mail, I'd guarantee the latter would give a *lot* more freedom of motion. Mr. Knight, i was told that poleaxes were used by knights during the middle ages as a combat weapon too (Not only a duel), Do you know if during XVI century those weapons were still used in battle by Gendarmes, Condottieri or other fully armoured horseman? If so, Where did they carried the poleaxe? Did military orders Knights used them too? Pollaxes were *certainly* used in battle as well as in single combats, but they were never used by horsemen; the pollaxe is strictly a weapon for foot combat. When on campaign the pollaxe would be carried in the baggage train and the man at arms would be armed with lance and sword while riding. Remember that more knights fought on foot in the middle ages than anyone would have you believe. I am not an expert on 16th-century combat, however, so I wouldn't want to comment on that period.